As the HDDs prices got extremely low this days, and after many chats with a friend talking about how we never listen or watch files once they were burnt on dvds, I decided to build my on storage server to "unburn" all my media. I had a LOT of old HDDs, mobos and so on. At first thought about using old IDE drives with inexpensive IDExUSB converters into a lot of USB hubs. But after some tests, this setup showed to be very unstable. Also had the problem with the IDE drives size. The biggest one was 160Gb. So, even with a lot of them plugged, noise, heat and power consuption, the amount of space was ridiculously small. But it led to meet Flexraid. Pooling all of them together was a basic requirement to my setup. Linux, FreeNAS, WHS and a lot of other options had been considered. But Flexraid, even on the first baby steps seemed to be the way to go. So I decided to gather some better hardware, research a little more and wait a few months to Flexraid to mature. Decided Flexraid was mature enough for me a little before the 2.0 previews (1.2 or 1.3 if I can remember). Another important features that made me choose Flexraid were the OS flexibility (linux or windows), no formating of the DRUs were needed and the gracefull restore method with no need of complex system tricks. It all along with drive pooling, network sharing as DRUs and other things made Flexraid perfect to my needs. So I decided to use an old but powerfull enough mobo I had (an ABit VA-10) along with an Athlon XP 2000+ and 2Gb of RAM I had in a pile of old things. Although the mobo has no embedded SATA controler, I had an (old too) Silicon Image SiI 3112 SataLink Controller hanging around and a SATA2IDE adapter too. So I could plug 3 SATA drives and 2 IDE with it. Good enough for a start. Next step, get a case. I have SERIOUS problems with space. The case should be thin enough to fit my HT rack (the only place avaiable), but deep and spacious enough to fit all the hardware. I didn't had the money, time or skills to build one, so it had to be of the shelf. Luckly I had an old (old old old stuff all over ) Compaq case I once ment to use on my CarPC setup but never did (and the technology just turned carPCs almost useless). It had the fitting nuts to an microATX mobo, the holes for the PCI cards and backshield. The only issue was the PSU. 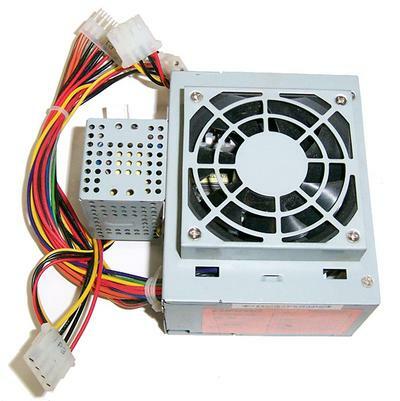 Compaq used an weird proprietary form factor too small to fit and standard ATX PSU like the one below. So, with some ingenuity, I sawed the back panel of the PSU so I can still use the power plug. Untouched and with some tricks the case could fit up to 6, max 7 HDDs with a new hole in the bottom. But I plan to use up to 12 HDDs. But before I could think of it, I bumped into an overheating problem. And I was using only 3 HDDs (but no power off). So I drilled some holes on the top of the case using another case side panel as a patern so I could fit and 12cm ultra low noise fan. Solved the problem. But as I kept adding HDDs, things got HOT. A few more fans did the trick but I was AWAY from the 12HDDs plan and some of them already shutting down due to overheat. When the 7 HDDs limit was reached (5 of them small ones), the heat got critical. So I got 8 of 4cm fans I had (4 of them fits perfectly a 5,25'' bay) and hooked together, they did the job. But they were noisy and ugly. And by the time, the case was still white and the fans were black, making the whole thing ever worse. At least, I was using flexraid for a while then and my data was safe. Almost all the small drives were replaced and a new SiI 3114 Raid Controller was added to handle the HDDs additions. Windows 7 was definetly chosen as host OS and the other software I needed (uTorrent, web server and others) were configured and running fine. So, in the last but not final upgrade, I spent a week to completely rebuild the whole thing. Stripped the server apart and started by painting everything black (top view above). As I live in a apartment it came really well. I have no outdoor space or garage, no paint gun and the paint "cabin" was a printer box. The front cover was cut with a micro grinder. Four new low profile, low noise 8cm fans with air filters were installed and some hinges too so I can hot swap drives in the future. The inner guts of the case were cut too and some modified ATX cases HDD trays were mounted sideways so the 12 HDDs can fit with no problem and the air from the fans can flow between them. Not the prettiest thing in the world, but does the job and is not deathly ugly. The job isn't complete. The inner frame has to be cut so the HDDs can be removed and a backpanel with fixed SATA and power connectors must be built so I can hot swap drives too. I'll update this post when I finally finish the build (not any time soon). As I've reached the SATA controllers limit, a new one is on the way. 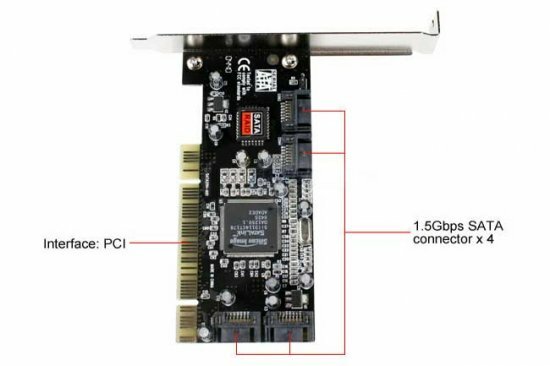 Don't know if another SiI 3114 or a PCI-e 8xSATA solution as many of you are using. The problem with the last is replacing the mobo and other stuff. So it's most likely the first option as long as SATA1 throughput keeps enough to my needs. Even with the low noise fans, things got a little too noisy for me. I'm buildin and PIC based PWM fan controller so the fans can even shut down if the corresponding HDDs behind it are cool enough and it will be so small it can fit the minimum space left even with the five temperature sensors I plan. Yep! Love seeing projects utilizing old hardware! Still useful and cheap! Good post and nice work! !